In July 2012 the Ripa International Center was inaugurated and blessed by the three lineage Masters, H.E. Namkha Drimed Rabjam Rinpoche, Dungsey Gyetrul Jigme Rinpoche and Dungsey Lhuntrul Dechen Gyurmey Rinpoche, in the presence of numerous representatives of public authorities, dignitaries and organizations. As an abode of peace and inspiration, the center strives to provide a wide range of educational opportunities that aim to sharpen our senses and minds for what is essential, as well as to facilitate learning the timeless truths of Buddhism. 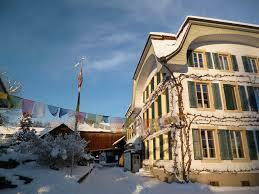 All the spiritual activities of the Ripa lineage in Europe take place here. In this spirit, we organize regular meetings to practice together. These meetings are open to all. The practice contains specific forms from the teaching tradition of the Ripa lineage. For instance, visualization, mantra recitation and meditation are helpful means to bring us closer to our own spiritual nature. Accordingly, our ways of thinking and acting become calmer and clearer, and we develop a more open and more tolerant attitude toward ourselves and toward our fellow human beings. The center is also open to organizations with similar objectives to hold their courses, meetings and seminars or other special occasions. Likewise, it offers a most suitable environment for individual retreats. The Ripa International Center is an International Buddhist Center where the humanitarian and spiritual aspects of Tibetan Buddhism can be developed and practiced. Since the 1990’s Gyetrul Jigme Rinpoche – and his father, His Eminence Namkha Drimed Rabjam Rinpoche – have been teaching in various countries in Europe, America and Asia. A constantly growing body of students attend these precious retreats, teachings and other events. In order to support and ensure the activities of the Ripa lineage, various national organizations were founded (Padma Ling and Ripa Ladrang). With each year it became increasingly difficult for our teachers to take into account the countless venues coordinated by the numerous organizations and to find the time to respond to the numerous requests for these profound teachings. Thus the idea for the Ripa International Center was born. Its central location in Europe constitutes the proper foundation to ensure access to the uninterrupted wisdom flow and transmission to the West from the Ripa Lineage. Our center is a place for practice, a place where the teachings can come alive. Here it is possible to link the authentic wisdom tradition of the past with the present and thereby, safeguard these spiritual treasures as a legacy for the future. 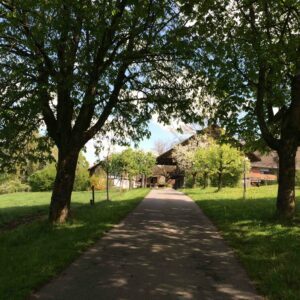 The grounds are located in Ried (Niederwangen), a small locality in the vicinity of Bern, Switzerland. The hilltop position, surrounded by pastures and forests, offers a panoramic view of the Jura mountain range and the Bernese Midlands.The ample property encompasses various buildings and facilities: two main residences, a staff building, a timber-framed farmhouse, stables and sheds, a gym hall, a riding arena, a sports field, a tennis court, a swimming pool, a garden, a park and agricultural grounds. In a six-month-long renovation scheme, the property was adapted so that is fit to serve as a venue for encounters and seminars. The conversion involved the installation of private bathrooms in a number of rooms, the renewal of the main kitchen, as well as the complete transformation and refurbishment of seminar and conference rooms.